Charlene Raddon is a bestselling author of western historical romance novels. Her first book was a Golden Heart Finalist and all her books since have received high accolades. Charlene might well be the only author who never intended to be a writer. After a vivid dream one night she began writing and has been at it ever since. She loves to read, do genealogy, crochet, and spoil her cat and her grandchildren. 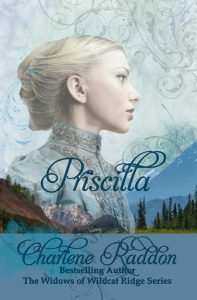 She also designs book covers, specializing in western historical covers.